On the Beach The damaged airplane was towed ashore by the fishermen. The railway station of Belmonte Calabro can be seen to the rear. Transcribed & translated by Giovanni Giorgetti, 12-15-05 Belmonte Calabro. 4 evening. At 11 pm yesterday, the airplane of the English airwoman Miss Spooner fell into the sea about three kilometres offshore from the Belmonte Calabro railway station. Miss Spooner was attempting a flight from London to Cape Town. Fortunately, the airplane stayed afloat. After shouting for help for a long time, without any response, Miss Spooner decided to dive into the water and started swimming toward the shore, while her co-pilot remained aboard the airplane. Miss Spooner, although numb and exhausted, finally reached shore near the railway station of Belmonte Calabro. Although it was late at night, she easily obtained help. In the meantime, the calls for help by Captain Edwards were heard by some fishermen who directed their boats towards the airplane. After several attempts, the aviator was rescued and the airplane was towed ashore. Captain Edwards sustained slight injuries to his nose and the airwoman Miss Spooner also sustained slight injuries her nose and to her upper lip. Winifred in the Wrecked Plane Miss Spooner photographed during one highly summarized inspection of the airplane towed aloft from the fishermen. The Details of the Plane Crash Rome, 4 evening. 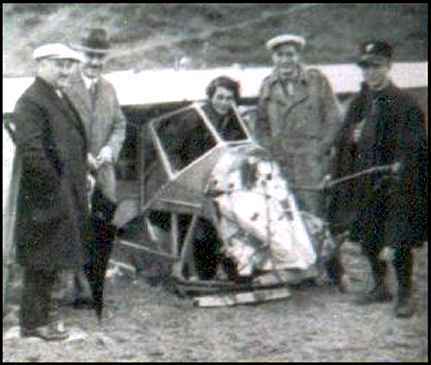 From Belmonte Calabro has come word that the brave English airwoman, Miss Spooner, fell into the sea because of a mechanical failure to her airplane. The airwoman and her co-pilot both escaped serious injury. As everybody knows, Miss Spooner was trying to break the flight record from London to Cape Town. Yesterday evening at 6:40 pm, she landed safely at Littorio's airport, where numerous aviators were present to welcome her. Miss Spooner, who had successfully taken part in the Giro Aereo d'Italia, (Aerial Italian Turn), has become very well known during her short stop in Rome for refueling. She declared that she was well satisfied with the first leg of her flight, which she had completed in exactly 10 hours and 40 minutes. 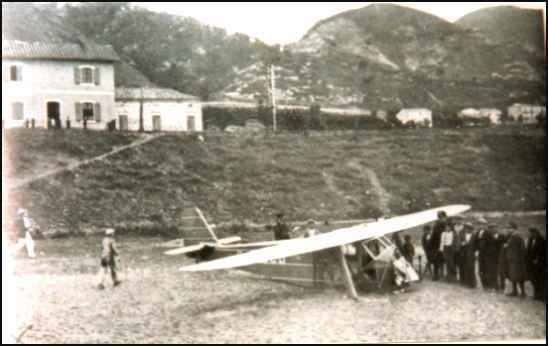 The airwoman had said, "I left from Lympne on 7:00 am, English time, which is 8:00 o'clock, Italian time. I flew without any stops. The journey went very well, except when I was a few hundred kilometers off southern France, strong fog banks hampered visibility. I crossed the Alps Marittime at 4200 meters in order to avoid having to lengthen the route by following the coast," and she had added, " My co-pilot Edwards will fly the plane from Rome to Catania." 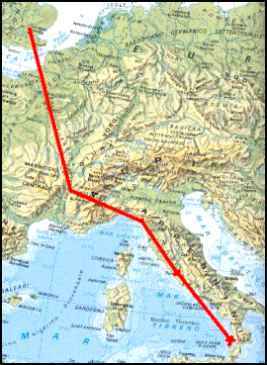 At 8:00 pm, after having completed refuelling, Miss Spooner and Captain Edwards resumed their flight toward Catania, where all those present greeted them. The news, just arrived from Belmonte Calabro, reported the interruption of the superb and adventurous race. At 11:00 pm, because of an unspecified mechanical breakdown, the airplane of the English airwoman fell into the sea in front of the Belmonte Calabro railway station. The airplane fortunately remained afloat. During the night, Miss Spooner and Captain Edwards shouted for help, but their cries were not heard. After some two hours, Miss Spooner bravely dived into the water and started swimming toward the shore, which she succeeded in reaching after some time. The airwoman headed toward the railway station, where in spite of the lateness of the hour, an astonished staff came around her at once. Miss Spooner, who was both numb and exhausted, was immediately warmed and rested. In the meantime, finally some fishermen had heard the cries for help from Captain Edwards and promptly came to his aid. The boats which were trying to reach the airplane were buffeted by strong waves. After several attempts, Captain Edwards was rescued. The airplane was then towed toward shore. By the time the airplane had been secured, it was 8 o'clock in the morning. A large crowd had gathered to observe the towing operations and Miss Spooner was also present. She was completely exhausted from the emotional strain in the incident. A warm demonstration of sympathy was shown to the intrepid airwoman. Captain Edwards had not been very seriously wounded in his forehead and his nose and immediately received the appropriate treatment. We have the following details about the incident which happened to Miss Spooner. The airplane had been caught in a storm and fell into the sea about three kilometres from the beach of Marina di Belmonte on March 30. When the plane hit the water, Miss Spooner was thrown out into the sea. After swimming for two hours and although she was exhausted, she finally reached the beach close to the railway station of Belmonte Calabro. She lay there in a semiconscious state and was discovered by an employee of the railroad who transported her in his arms to the station where she received first aid. 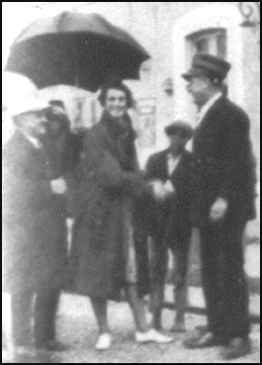 The Podest�'s Delegate, (Translator's Note: The Podest� was the head of the municipal administration appointed by the king during the fascist regime), of Belmonte Calabro: as soon as he became aware of the situation, set out in two rowboats in search of the airplane. At about 5 o'clock in the morning, it was found approximately 100 meters from the beach, where it had drifted in a favorable current. The airplane was partly submerged and was being floated by the wings. The pilot was found to be holding on to the rudder. The airwoman Spooner, after having received treatment from the municipal doctor, escorted by the Podest�, also set out in another rowboat to search for her co-pilot. By 6 o'clock, she had reached the airplane, near which was one of the two boats previously involved in the search. The two boats, by combining their efforts, were able to tow the seriously damaged airplane to safety, as well as to save Captain Edwards. The two pilots had been cared for in the home of the Podest�. Their minor contusions and abrasions were all healed after about ten days. Captain Edwards still has some minor problems resulting from his exposure. However, both are generally in good health. The director of the Hospital of Cosenza. along with an assistant and carrying emergency supplies, rushed to the location where the two injured aviators were enjoying the hospitality and the very attentive treatment by the local authorities. The Air Minister himself sent an official to the place to offer support to the two aviators. ITALIAN VERSION If you read Italian, you can enjoy the original articles, as transcribed by Giovanni Giorgetti, by clicking on the title above.